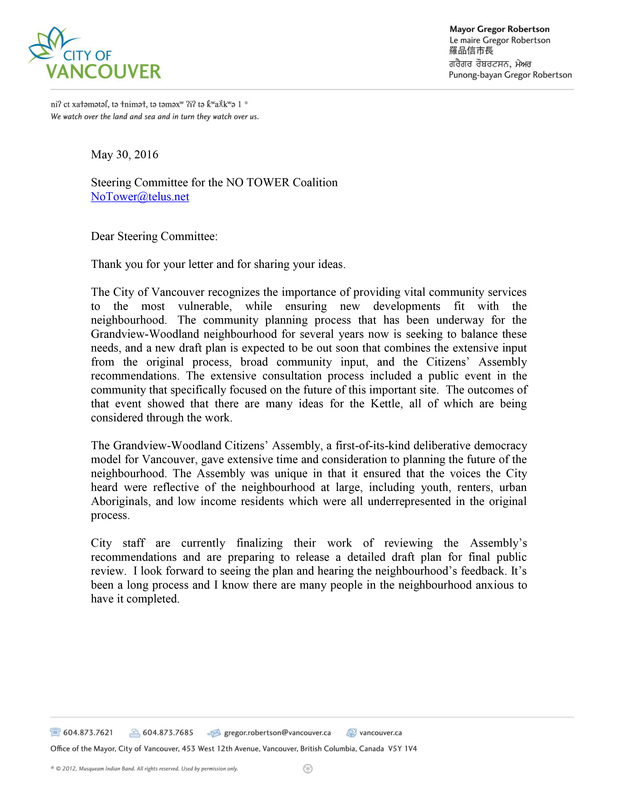 We received your letter of May 30, 2016, in which you decline to meet with the NO TOWER Coalition to discuss concerns related to a proposed multi-tower development for Commercial Drive and Venables and Adanac in Grandview-Woodland. We are extremely disappointed that you have refused to meet with us. As one of our elected representatives, it is your public duty and your democratic responsibility to listen carefully to all your constituents. And over the past year we have met with ten members of Vancouver City Council. Why not you? 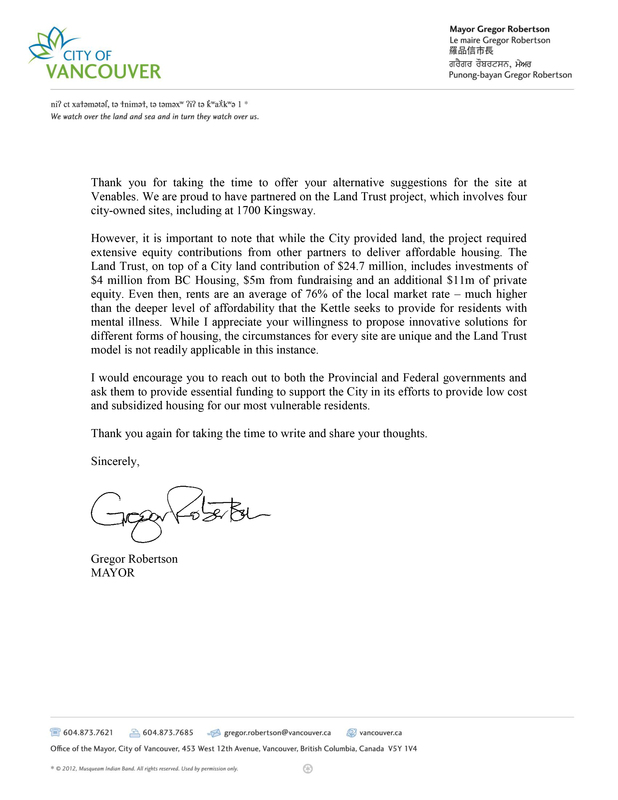 We note that you recently apologized publicly for not being more open and accountable to the citizens of Vancouver. We hope that going forward, you can honour that sentiment. We also recall that on September 25, 2013 you specifically directed your planning team to bring forward a proposal for a “substantially reduced height” for this specific proposed development, and that staff report back on this matter by the end of 2013. Still, almost three years later we have no indication of what the result of that request might be. Can you tell us? The citizens of Grandview-Woodland are keeping a close watch on their elected representatives and the city staff under their direction, as we await the release of the next iteration of our community plan. Our community expects nothing less than an honest and responsive community plan, one which has heard the community’s concerns and has acted upon them. In the past 12 months we at the NO TOWER Coalition have actively engaged with our community about the proposed BOFFO/Kettle project. We have held over 130 hours of community information sessions at Grandview Park. We have spoken to thousands of residents and visitors who wish very much to discuss this proposal and to learn more about it. We have made a model of the proposal, and adapted it as more information became publicly available. We have developed before and after images of the proposal, based on the developers “renderings”, to indicate the realistic changes in our current low-rise streetscape this proposal would bring. We have crafted at least one viable alternative for the Kettle Friendship Society and there may be many others. We have gathered over 4,000 signatures against the proposal on our petitions, and “NO TOWER” lawn signs are to be seen everywhere in the neighbourhood. All this is in sharp contrast to the city’s resounding silence. You, along with the developer have steadfastly refused to meet publicly with the citizens of our community to specifically discuss this proposal. In your letter to us, you reference the need for our group to lobby the federal and provincial governments for funding to support affordable housing for the non-profit sector. We note that the BC Government has recently issued a RFP to the community asking for proposals for new provincial dollars available (up to $50 million in 2016–2017 “for affordable housing for people in greatest need” — BC Housing news release April 14, 2016). Additionally, the federal government recently announced its Canada 150 Community Infrastructure Funding Program. Both these initiatives are proof positive that federal and provincial dollars are on the table for the asking. In fact the city holds the key. By contributing its land (the north parking lot) many dollars could be unlocked, giving the Kettle what it requires. Recently Heritage Vancouver held a well-attended symposium entitled “What’s So Special About the Drive? The very fact of such an event attests to the major role Commercial Drive plays in the cultural and economic vibrancy of Vancouver. It is one of our very special high streets and much loved by many. A tower such as the one proposed by BOFFO/Kettle and originally supported by the city, would bring many unwelcome changes to the Drive, including loss of nearby social housing, further increases in land and rental prices and a further loss of housing affordability. Surely you realize the negative impacts this development could have on our community. While we support the overall goals of the non-profit sector to provide for the neediest in our society, this must not happen at the expense of an entire community’s well being. Posted in Correspondence on June 6, 2016 by jakking. ← One Year Old and 4,000 Supporters Strong!